Hello every one this is my first post. I have a mk 1 rg250 I bought to restore to usable condition about 6 years ago. as it was so bad I lost interest in it for quite some time but in recent months I have renewed vigor to get stuck back in. on inspecting the basket it is off the bike as I have the engine totaly stripped down to rebuild. I noticed the primary gear on the back of the basket had a lot of backlash when I thought it should be really tight and not move. On checking the internet I discovered there are rubber cudh drives at the back of clutch baskets,the first I had heard of it. so I removed the backing plate off mine and indeed there where 2 circular rubber discs and 4 sort half round discs with a flat at one side. I did take a picture of it but will have to check out a bit more as to how I can get them to show up here. but the other 4 cushions where ratteling about, they looked far too small I can only emagine they have shrunk really badley over the years. So I started checking if I could get replacements for these rubbers but there are none available for the rg basket. although you can get them for the lc/rd they are not the correct size for the rg they are too small plus they are like £50 plus a set Yike not my type of price bracket at all. So I am intending to knock up a mould and make just the round rubbers they can replace the weird shape rubbers as all the slots they fit into are the same, out of polyurathane. but that will be in a month or two. as I need to get some free time on a mill to make the mould and research the urathane a bit more as you can get it in different hardnesses. I had a similar problem when I rebuilt my SDR. I ended up stripping all my spare basket assemblies to make up the best set of cushions I could. I'm interested to know how you get on with making new ones. I wonder would it be possible to carve a set from larger readily available rubbers from a newer bigger bike? Will be interested to see how you solve it. It seams to be a lot of motocross bikes change them every so many years. that are not usable in other baskets. So I was going to contact one of the urathane suppliers and try and confirm with them the correct type that is happyto live its life in warm oil and get a bit of a pounding. and if I make the mould myself it will not be expensive to have a crack at it. 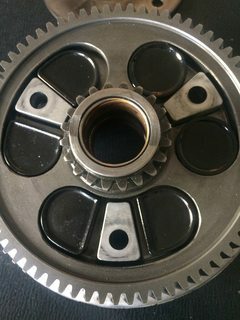 the guy has the same bike as you and he found a Japanese site that just does parts for the SDR and was able to buy the clutch rubbers off them. He said the were selling the whole clutch Basket but he contacted them and they sold him just the rubbers. Glad its not just me who couldnt find a replacement for the cushions. Yes Hopefully it should not be a problem. I have access to a de gasser so no air bubbles in the urathane. The mould is easy enough I just need the time on the mill. Plus I am assemblying my crank so maybe start a new thread with a couple of pics. Thanks for the info. I have bought parts from that Japanese supplier in the past and asked whether the rubber cushions were available to buy separately. At the time I asked, they weren't. I have just had a look at the website and it appears that the clutch basket repair is no longer offered. I have tried to discover the source of new cushions, but have so far failed. I imagine that they are fairly easily available if you know what to order and who to order it from - unfortunately I know neither of these details . Thus, I will watch your progress with interest! James checked out your thread you have done a lot of nice stuff to your bike. I enjoy the machining research trawling the internet side of restoration projects the whole how am I going to fix this part with out it costing me a fortune. your clutch rubbers look similar to the RG what size are the circular rubbers? ...what size are the circular rubbers? The circular cushions from the SDR/DTR are 22.5mm OD, 10.5mm thick. Although all of the cushions in my collection measured similarly, I would be wary of using these exact measurements to manufacture new pieces. I have no idea of the shrinkage or deformation which may occur during 10,000+ km travelling with the particular material used, whatever its exact composition may be! Still looking into this it's a bit slow getting acurate info from the suppliers for a home based set up. the rest are made from the polyether base. some of the suppliers of the casting resins just don't seem to know the difference when you really ask them specific questions.